When it comes to decorating Easter eggs, the options are limitless. In fact, I can’t think of the last time I’ve sat down and just dyed Easter eggs. Instead, when I’m invited to craft with my little cousins, I usually bring along a Sharpie, some temporary tattoos, rubber bands for tie-dying, or even gold leaf (which you can see here). This year, I was looking for a sweet and simple egg decorating idea that hadn’t been done before (at least by me!) 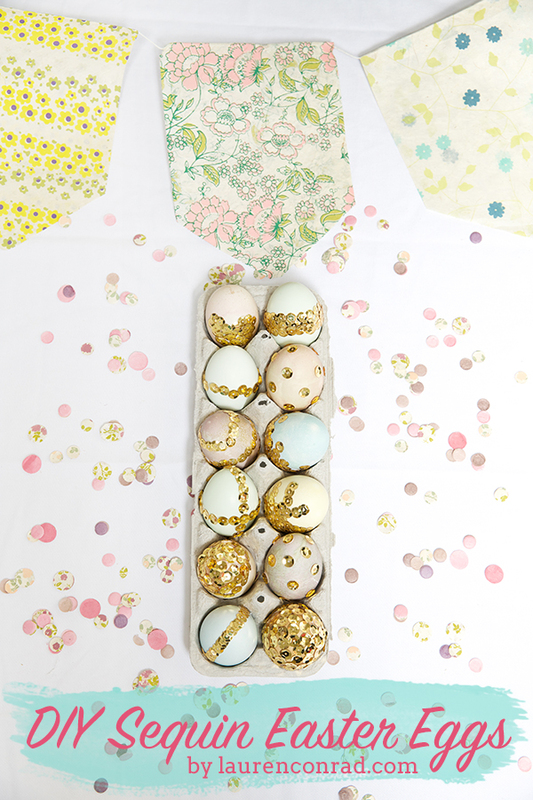 Enter: sequin Easter eggs. You can’t go wrong with a little gold sparkle in my opinion, and sequins are less messy than glitter—which is always a plus. 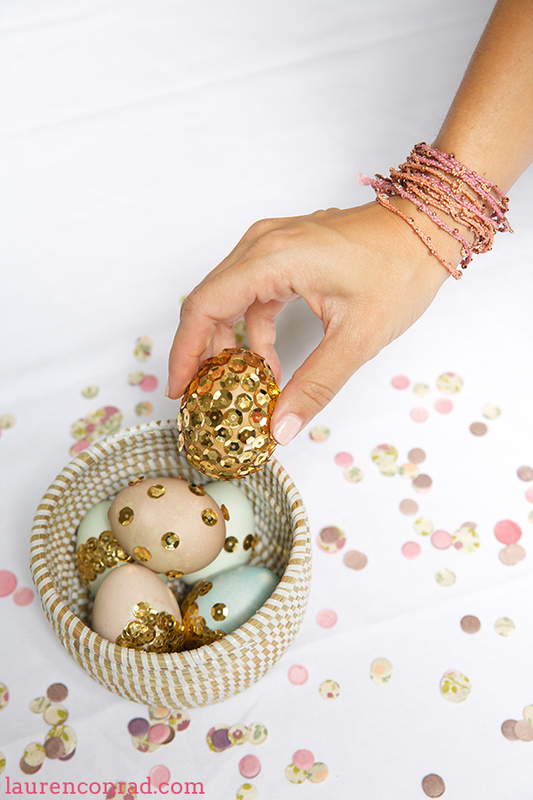 My fellow Team LC editor Allison and I spent a couple hours crafting these sparkly eggs, and they were so much fun to design. They’re sure to add a festive touch to your holiday tablescape or Easter display. They’re probably a bit harder to camouflage in an Easter egg hunt, however! Dot the Elmer’s glue on the egg, and individually apply each sequin. If you are looking to cover the whole egg or any significant surface area, use a paintbrush to spread the glue around. Try adding stripes, polka dots, shapes, or covering the entire egg if you like. Let dry completely. Note: We also experimented with a hot glue gun, but we found that plain old Elmer’s glue was easier to work with. There you have it! Pretty easy, huh? And for anyone asking, the adorable mini basket and pretty bracelets are from Lauren’s fair trade shop The Little Market. How are you going to decorate your eggs this year? P.S. A big thanks to BHLDN for the pretty spring confetti and floral bunting that we used to spruce up our Easter spread. We love BHLDN’s décor for all kinds of celebrations.